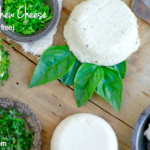 Looking for a dairy free cheese substitute? Look no further. 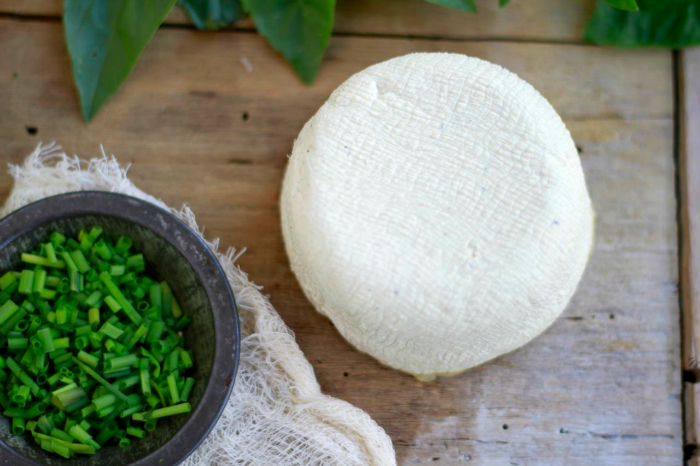 Here’ a tasty and tangy herbed cashew cheese that will be the highlight of any cheeseboard that you make. Can’t tolerate dairy? I know the feeling. My understanding is that when we are much younger, out bodies have the ability to digest dairy and lactose. But as we get older, we lose the ability to produce lactase, the enzyme necessary to break down lactose in the small intestine. According to Chris Kresser, only about 40% of the world’s population are able to digest lactose after childhood. I’m actually not totally against dairy and do give my little one fresh RAW milk from a local farm and make raw milk yogurt for my family on a weekly basis. 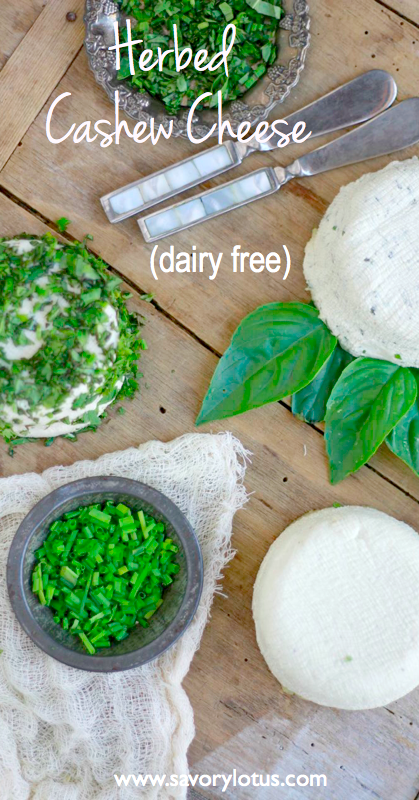 I do believe that raw dairy is a wonderful superfood that has many many nutritional benefits. And I have learned that what some people believe to be lactose intolerance is actually symptoms of other gastrointestinal disorders such as SIBO, celiac disease, or IBS. You can read more about that HERE and HERE. My daughter and I are both currently on a gut healing protocol through our functional medicine doctor that does not allow any dairy. In order to stay inspired and committed to our health and healing, I am constantly trying to create foods that spark our interest and keep us motivated. This cashew cheese is one of those. 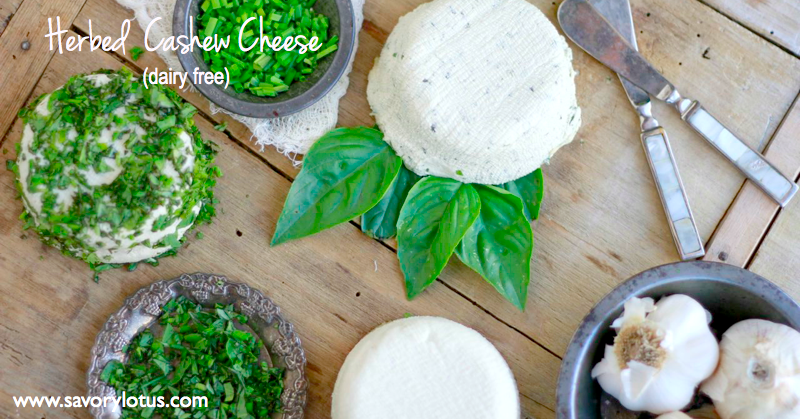 There are actually 2 ways to make this creamy and delicious cashew cheese. My preference is to take the time to ferment the cashew cheese (with either probiotics or sauerkraut juice) as it gives it a complexity and tang that I miss from real cheese. 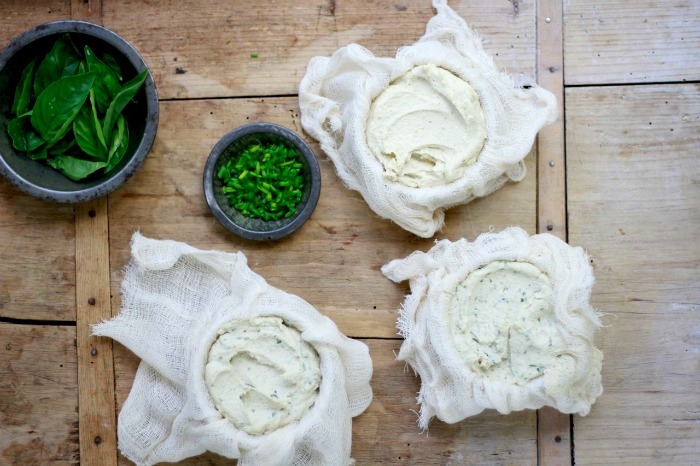 But if you just want a quick, easy, and spreadable cashew cheese, you can follow the easy instructions. It will still be amazing. This recipe is super versatile. Feel free to add any ingredients that make you happy. I generally stick to a few herbs like basil, chives, parsley, and cilantro. But I bet olives, sun-dried tomatoes, or dill would be amazing as well. I sometimes just leave it plain. I’d love to hear what you come up with. 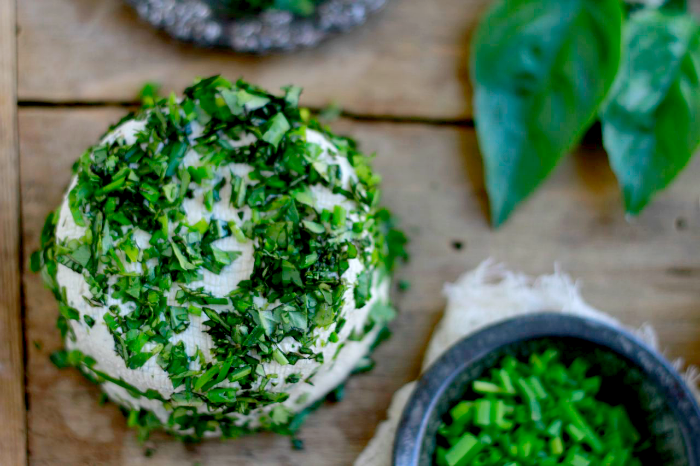 You can also play with adding the herbs into the cashew cheese or leaving it plain and then rolling your cheese in fresh herbs just before serving. Lots of options here. Soak cashews in water for at least 4-6 hours. Drain and rinse well. Process drained cashews and coconut milk in food processor until creamy smooth, about 5-7 minutes, scraping sides a time or two. Be patient here. This cheese is amazing when you get it nice and smooth. Add the remaining ingredients and process another minute to full incorporate. Feel free to add a tsp or 2 of liquid here if you prefer. I like mine pretty thick. Adjust the salt and pepper. Place in fridge to cool completely. Serve and enjoy! The night before making the cashew cheese, puree the soaked cashews (drained and rinsed), coconut milk, and salt until completely smooth and creamy. Be patient. This will take about 7-10 minutes. Scrape the sides once or twice. Once smooth, put in contents of probiotic capsules. Process briefly to combine. If using sauerkraut juice, omit the coconut milk and just process the drained and rinsed cashews with the sauerkraut juice until creamy smooth, about 7-10 minutes. Place mixture into a clean bowl, cover loosely with a clean towel, and place in a warm place to ferment for 12 hours. Some folks just place in oven with the light on, some use a heating pad, and I use my Excalibur dehydrator set to 100′F. Once done fermenting, fold in the rest of the ingredients until well incorporated. Adjust for salt and pepper. Line a small glass bowl or ramekin with a double layer of cheese cloth and press the mixture into the container. Fold the cheesecloth over to cover. Place in fridge to cool, harden, and take shape for at least 4 hours. I like to moisten the top of the cheese clothe ever so slightly to keep it from drying out. Serve as is or roll in more finely chopped herbs. ENJOY! NOTE: Be sure to use keep your cooking utensils and bowls super clean to ensure proper fermentation. This looks really great, I can’t wait to try it! I’m wondering if you know how long this will last in the fridge? And can it be made in advance and frozen at all? My cashew cheese has lasted up to a week in the fridge. Fermenting it will make it last a bit longer in the fridge. I haven’t tried freezing it. Not sure how the consistency would change after defrosting. Thanks so much for coming by. The nutritional yeast gives it a nice “cheesy” flavor. You can just leave it out. Maybe add some garlic powder for flavor. Let me know if you try it. This sounds great! I have made a few almond cheeses but never cashew. I will have to try this out! I have been trying but i have never got white colour as yours ! Cashews can tend to give a slightly off white hew. Once I add the coconut milk, it tends to get more white.